LONDON, GREATER LONDON, UK, July 6, 2018 /EINPresswire.com/ -- Growth of the fertilizer market in Western Europe was a negative 0.7% year on year from 2013 to 2017, so that the market shrank in value, the Fertilizer Global Market Report 2018 from The Business Research Company shows. It will continue to shrink, though more slowly, in the years to 2021. One reason is that the 28 member countries of the European Union have all introduced stringent regulations controlling the use of chemical fertilizers. A European Union safety regulation called REACH (Registration, Evaluation, Authorization and Restriction of Chemicals) stipulates that all chemical substances including fertilizers must be registered. Another regulation, CLP (Classification, Labelling and Packaging of substances and mixtures) aims to ensure the safety of consumers and workers. These regulations tend to increase operational costs for fertilizer companies, affecting fertilizer prices and restraining the market. Lengthy procedures to get approvals from certification bodies are also increasing the overall costs associated with fertilizers. China, too, until 2017 easily the largest consuming country for fertilizers, worth nearly a quarter of the global total, has now introduced strict controls. Regulations on the market such as these will hold back global growth going forward to only 2.7% a year, below global GDP growth and substantially below the growth of the crop market to which fertilizer sales have previously been closely linked. Fertilizers are a segment of the chemicals market. 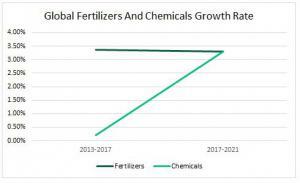 Until 2017 fertilizers accounted for nearly 10% of the chemicals market total and their market was growing faster than the overall market. The slow growth of the segment going forward, however, and accelerated growth of the other segments, will mean that fertilizers' share shrinks. The other segments are petrochemicals, plastic materials, toiletries, soap and cleaning compounds, paints and coatings, industrial gases, synthetic rubber and fiber adhesives. Asia Pacific is both the largest regional market for fertilizers, worth over a third of the global total, and also the fastest-growing, achieving above 5.4% year on year. Second largest is North America and third is South America. The second fastest-growing is Eastern Europe and the third fastest is the Middle East. Fertilizer Companies Covered: Yara International Asa, The Mosaic Company, Eurochem Inc., Potash Corp. Of Saskatchewan Inc., CF Industries Holdings Inc., Agrium Inc., Israel Chemicals Ltd., Uralkali, Sinofert Holdings Ltd., Coromandel International Ltd., Bunge Ltd., CVR Partners, Lp. Data: Fertilizer market size and growth for 7 regions and 12 countries; global regional and country fertilizer market size and growth segmented by type of fertilizer - nitrogen, phosphate and potash; global, regional and country fertilizer per capita consumption and market size as a percentage of gdp 2013-21; financial performance 2013-21 for Yara International Asa, The Mosaic Company, Eurochem Inc., Potash Corp. Of Saskatchewan Inc., CF Industries Holdings Inc., CF Industries Holdings Inc., Agrium Inc., Israel Chemicals Ltd., Uralkali, Sinofert Holdings Ltd., Coromandel International Ltd., Bunge Ltd., CVR Partners, Lp. ; global chemicals market size and growth rate 2013-17 and 2017-21. Other Information: PESTEL analysis, drivers and restraints, customer and operational insights, fertilizer market by country covering regulatory bodies, associations, investments, and competitive landscape; fertilizer market trends and strategies.